At a time of increasing volatility in healthcare provision, we are all having to become more responsible for our own well-being. This book – an imaginative, practical and accessible guide to our inner organs – is written for anyone who wants to improve their health and develop resiliency against illness. Although trained as a medical doctor, Olaf Koob has the vision and experience of a holistic physician. He has surveyed diverse medical systems – orthodox medicine, naturopathy, homeopathy, Chinese, ayurvedic and anthroposophic medicine – and found their common substance. Using this knowledge, he relates the essence of each human organ: its position, colour, form, embryonic development, function and characteristic attributes. Thus, the organs begin to tell their own stories, revealing their ‘biography’, physiognomy and the illnesses they are prone to. Inspired by esoteric wisdom, Koob creates living images of the pancreas and the hormone system and shows how the spleen, liver, gall bladder, heart, kidneys, lungs and reproductive organs relate to the wider cosmos. He describes the nature of poison and detoxification, good and bad nutrition and the importance of secretion and elimination. 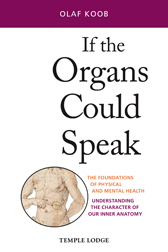 If the Organs Could Speak is a unique work that enables us to think more creatively about our bodies and how they function, and to help us cope with crises, suffering and pain. DR OLAF KOOB MD, born in 1943, studied medicine and worked as a school doctor in Freiburg and Wanne-Eickel. He has been a drugs counsellor, a general practitioner in Weimar and Berlin, a school doctor at the Berlin Therapy Centre for children with special needs, and spent many years collaborating on a research project into drug-related diseases and social factors. He currently lectures and leads seminars in Germany and around the world and is the author of many books on medicine and healing.